The second annual ‘Ride Around the Sound’ will circle the incredibly scenic Puget Sound – including through Burien – on Saturday, Sept. 14 to raise money for the American Lung Association. Organizers have shortened the main route to 75 miles, allowing riders more time to take in the beautiful Puget Sound scenery. 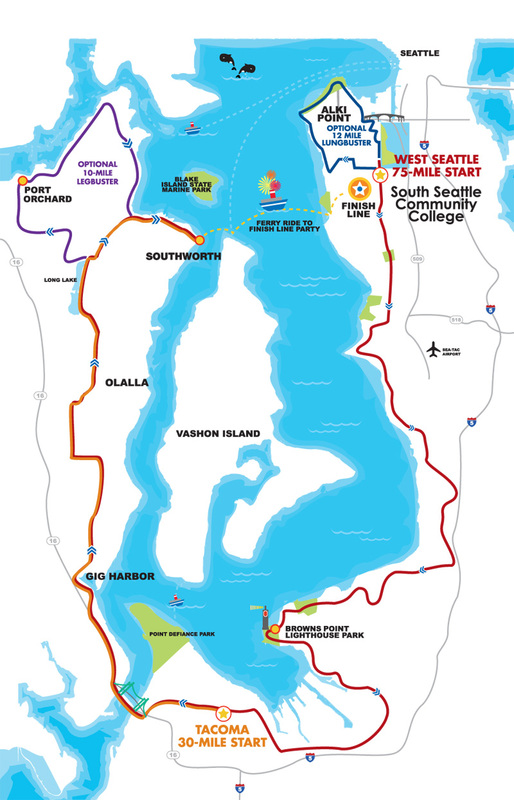 “But, if you really want to challenge yourself, add on the 12-mile ‘Lung Buster’ loop including Alki and 794 feet of elevation around West Seattle, and/or the 16-mile ‘Leg Buster’ loop around Port Orchard. Want to take it easier that day? We are also offering a 30-mile ride starting in Tacoma (with the option of adding the 16-mile ‘Leg Buster’). Everyone will still board a ferry from Southworth to West Seattle where you will end your day with a fabulous finish line party to celebrate your ride and relax with friends and family. This benefit ride for the American Lung Association is perfect as a personal challenge or to ride together with friends, family or co-workers. Proceeds help prevent and cure lung disease and promote lung health through education, advocacy and research. Ride Around the Sound is a fully supported, signature bicycle tour. Multiple distance options make this event perfect for all ages and abilities. Ride Around the Sound showcases the natural majestic beauty of Puget Sound with sweeping views and forays through the quaint communities hugging the water. Over half of the ride boasts views of Puget Sound, and the route is lined with lighthouses, marinas and wildlife. You will ride through beautiful forests, around coves and inlets, past picturesque hamlets and across the soaring Tacoma Narrows Bridge. After traversing the Kitsap Peninsula, views of Mt. Rainier loom over the Sound on the relaxing ferry ride back to the finish line party. Rest stops are an average of every 15 miles and are well equipped with delicious food, water, electrolytes, medical and mechanical aid. The courses are well-marked with easy-to-follow bold markings. To join in this fun fundraiser, click here.